After six years of waiting LucasArts made third episode of Monkey Island saga. Many of MI fans had already lost their hope of MI3 including me. 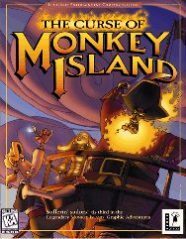 But then I (and many others) heard a rumor about Monkey Island game called Curse of Monkey Island. CMI has all that good adventure game needs: great hero, who doesn't complain about everything, awesome enemy, great graphics, genius story and good music. LucasArts made great MI game even without Ron Gilbert.